From Tbilisi, Republic of Georgia, pianist Natalia Kazaryan has been hailed by The New York Sun for her “prodigious ability,” remarking that she “immediately established an atmosphere of strength and confidence.” Ms. Kazaryan began studying piano at the age of six, and performed as soloist with the Tbilisi State Chamber Orchestra just one year later. A winner of Astral’s 2016 National Auditions, she has also captured top prizes in numerous international competitions, including the Eastman Young Artists International Piano Competition, the Kosciuszko Foundation Chopin Competition, and the Second New York Piano Competition. In 2012, she was the First Prize winner of the Concours FLAME in Paris and the Second Prize winner of Concours international de piano d’Ile de France. Upcoming performances include Rachmaninoff’s Piano Concerto No. 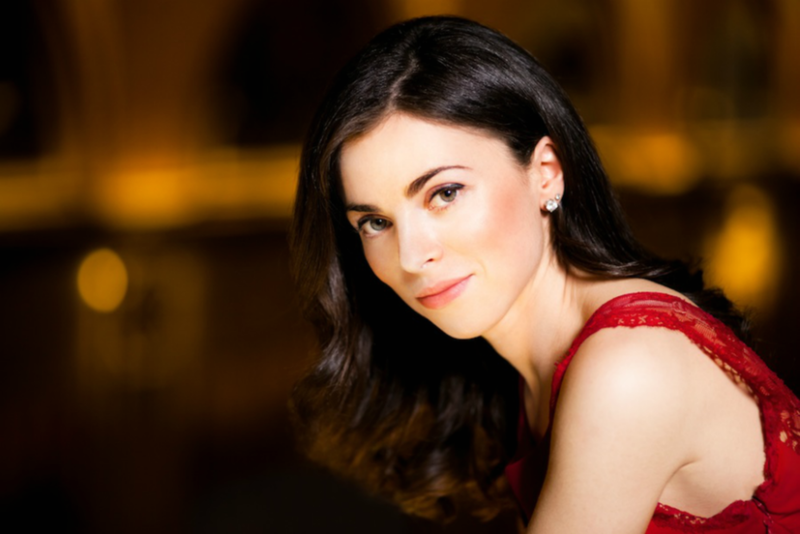 2 with the Harrisburg Symphony Orchestra and chamber music concerts at New York City’s University Club, the Kennedy Center and the National Gallery of Art in Washington, D.C. She gives solo recitals in Detroit, Washington, D.C., and Key West, and continues to expand her series of lecture-recitals showcasing works of female composers. Recently, she performed in Washington, D.C. on the Smithsonian Steinway Series and in an all-Messiaen concert at The Church of the Epiphany. She also gave a radio performance for “All Classical Portland” (OR), performed with the Ann Arbor Symphony, and appeared in New York’s Merkin Concert Hall and Philadelphia’s Kimmel Center for the Performing Arts. Ms. Kazaryan enjoys an active performing career across Europe. She has appeared in such venues as the Schloss Mirabell in Salzburg, Théâtre des Variétés in Monaco, Auditorio Sony in Madrid, and the Musée Carnavalet and Salle Cortot in Paris. She performs regularly at the Palazzo Tornabuoni in Florence, and has participated in the IMS Prussia Cove Master Classes in Cornwall, England. The first Juilliard student to participate in the Carla Bruni-Sarkozy exchange with the Paris Conservatoire, Ms. Kazaryan studied piano in Paris with Michel Béroff and chamber music with Valérie Aimard. An active chamber musician, she took part in the Ryoichi Sasakawa Young Leaders Fellowship, dedicated to collaboration between The Juilliard School, the Paris Conservatoire, and the Universität für Musik und darstellende Kunst Wien. She later won both a Fulbright Grant and a Harriett Hale Woolley Scholarship to Paris to continue her studies, with a focus on Olivier Messiaen’s Vingt Regards sur l’enfant Jésus. Natalia Kazaryan studied in the preparatory division of the Tbilisi Music Conservatory with Alla Nakashidze. She holds both a Bachelor and a Master’s degree from The Juilliard School, where she studied under Jerome Lowenthal and Matti Raekallio. From 2013-2015, she studied at the Escuela Superior de Música Reina Sofia in Madrid, under Dimitri Bashkirov, and in June 2014 received a “Sobresaliente” Award from the hands of Queen Sofia of Spain, for outstanding work and excellence. She recently concluded doctoral studies at the University of Michigan under Logan Skelton and holds an adjunct piano faculty position at Howard University.